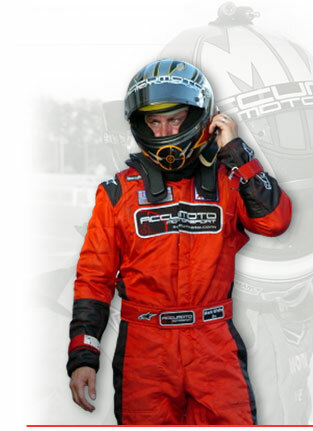 Accumoto's Tucker and White Finish the Year With Multiple Podiums and a Second Place Championship at Laguna! The warm California sunshine ignited a different type of fire during rounds eleven and twelve of the 2007 IMSA Lites Prototype championship at the spectacular Laguna Seca Raceway. The headline of this release only offers a glimpse of the story as a number of small dramas intertwined leading to one of the most anticipated races in series two year history. The L2 championship was a hard fought battle all season as the lead was traded between Accumoto Motorsport's Mark White and PVM's Robby Card after White experienced an uncharacteristic equipment failure in the sixth round during the New England Grand Prix weekend at Lime Rock Park. The excitement was reaching its pinnacle as there were only 6 points separating the pair after the 10 races leading to the Laguna weekend. White of Madison, WI had the upper hand going into the weekend's first race after topping the time sheets in practice and earning the L2 pole with a qualifying lap record of 1:27.1 around the 2.238 mile circuit. A bent wheel quickly extinguished White's championship charge however. After maintaining the lead during the start, a battle was heating up between White and Card when White's race ended abruptly after striking the curb in T6, a corner that has decided more than one championship since the curbing was resurfaced for motorcycles in '05. This incident allowed Card to continue on unchallenged for the Championship deciding win. When asked about the incident White replied, "We needed a flawless performance all weekend long to come away with the championship. Unfortunately, I was struggling to find front grip in the race and got a little greedy with the apex in 6. It was definitely tough to call in and tell Doug (Accumoto Crew Chief Doug Turnbull) it was over but he was incredibly supportive. His attitude is the key to the success we have had this year. Everyone remained positive and focused in spite of whatever we were dealing with. I am really proud of the program he and the guys developed this year." Perhaps nothing illustrated the positive attitude White was referring to more than the pre-race effort put forth by the Accumoto crew on his teammate Scott Tucker's car. A mechanical issue was discovered after the morning practice resulting in the decision to change the motor with less than three hours before qualifying. Turnbull commented on the effort, "It is all about the right people. Having quality crew like Kevin (Kevin Mitz, lead mechanic on Tuckers #94 car) and Leo (Leo Mathews, former lead engineer for West Race Cars) make my job much easier. They know these cars inside and out and I was confident we would have the car ready on time." The Accumoto crew weren't the only ones in the paddock moving at warp speed, however. Driver Scott Tucker had impressed everyone all week long as he proved to be one of the hardest working individuals in motorsports doing double duty between two different series. Also competing in The IMSA GT3 Cup Challenge, the Leawood, KS native had to work swiftly to get from one car to the next as several of the series sessions were back to back. Tucker seemingly remained unfazed by the time crunch as he qualified his Fast Cash Racing/Accumoto Motorsport West WR1000 in the forth spot and then raced cleanly to a third place finish! 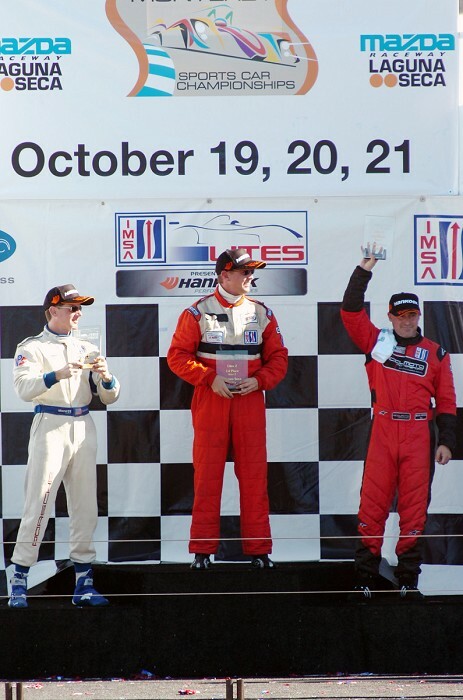 The finish gave him his second podium in only his fourth IMSA Lites start.